Queenie and TR return in Di Morrissey's sequel to the bestselling Heart of the Dreaming. Queenie Hanlon has a perfect life. She's the mother of two adoring children, the wealthy owner of a thriving outback station and the wife of handsome bushman TR Hamilton. Her bitter and vengeful brother returns from Italy to lay claim to his inheritance. Her precious daughter is seduced by her uncle into giving up all Queenie's strived for. And her beloved TR, injured in a riding accident, can no longer recall the life they once shared. 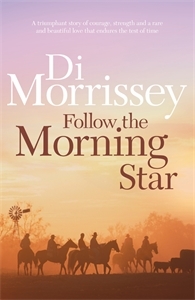 Follow the Morning Star is a triumphant story of courage, strength and a rare and beautiful love that endures the test of time.